"Fast Food Nation" tells the story of the marketing executive (Greg Kinnear) at Mickey’s fast food chain. As it is revealed that the best sell burger, "The Big One" has tested positive for traces of E. coli, our executive hero takes it upon himself to investigate the scandal. He begins a journey that will fundamentally change the way he sees his business. In Texas, where his burger meat is produced, he discovers that America’s insatiable appetite for cheap meat is a truly dirty business. Far away from his corporate California office, he is faced with the bitter reality of immigrant workers, brutal slaughter methods and learns who is responsible for the miserable quality of the meat. "Fast Food Nation“ is based on a 2001 New York Times bestseller book by Eric Schlosser, an American journalist who revealed the dark side of the "all- American meal". Celebrities such as Bruce Willis, Kris Kristofferson and Avril Lavigne also star in this film, as they felt personally drawn to support this film. "Fast Food Nation" is not a conventional documentary, but a feature film containing documentary elements, a so-called "docudrama". Films with a similar structure are "We Feed The World", or "Our Daily Bread". 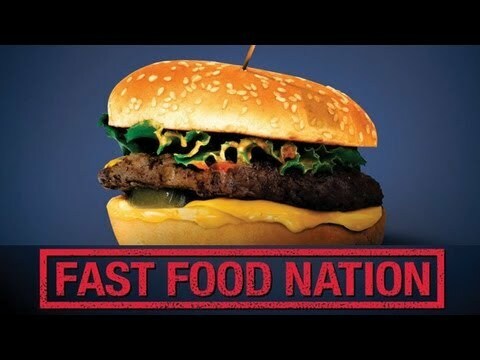 "Fast Food Nation" is a captivating film which gives an entertaining insight into the fast food industry.